Every year upwards of 20,000 lives are lost in war-torn countries due to unexploded ordinance such as land mines. 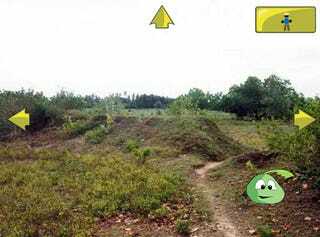 Can a video game educate children about land mine avoidance where traditional methods have failed? That's the hope of Corey Bohil, a visiting assistant professor at Michigan State University's Department of Telecommunication and project lead on Undercover UXO. Undercover UXO is a simple computer game that sees players navigating a pet through a maze in order to find food. Throughout the maze are the telltale warning signs of unexploded ordinance - dead cattle, disturbed ground, and the shells of burnt-out vehicles - which the player must report to a local inspector lest they risk losing their pet. "The goal of the project is to teach children in Cambodia and other at-risk areas to recognize and avoid unexploded ordnance," said Corey Bohil. "If the player recognizes the indicators and avoids them, then the pet finds the food and everyone is happy." The project began life as a student project in a class taught by Bohil called "Collaborative Game Design." The motivation behind the game's development were shocking statistics from the United Nations Mine Action Service, which estimates annual unexploded ordinance related deaths at around 20,000, along with the failure of traditional teaching methods. "For years the local communities would try to teach people how to avoid landmines," Bohil said. "They would have presentations made to community elders, publish booklets, and nothing would work." Since the projects first showing last year at MSU's Meaningful Play Conference, the concept has been further honed thanks to input from the Golden West Humanitarian Foundation, the only non-profit organization in the U.S. dedicated to removing unexploded ordinance from disadvantaged countries. The U.S. government chipped in as well, with $78,000 supplied by the U.S. State Department's Office of Weapons Removal and Abatement. "So now we're working to make the game better – make it less clunky and get out some of the bugs," Bohil said. "It will be sent to Cambodia in March for testing to see if the kids like it." Bohil hopes the game can be used alongside One Laptop per Child, a program dedicated to developing and deploying inexpensive laptop computers to children in underdeveloped nations. Check out the link below, where you can see a rough video demonstration of the game in action. So the question remains, can a game succeed where traditional learning methods have failed? I don't remember half the things I learned in thirteen years of government schooling, but I can tell you exactly when to jump to avoid those damn birds in Ninja Gaiden. If that sort of retention translates to the children of war-torn nations like Cambodia, then Corey Bohil and his students could be responsible for countless lives saved, all over the world. In case you needed proof that gaming isn't just a leisure-time hobby anymore, then here it is.